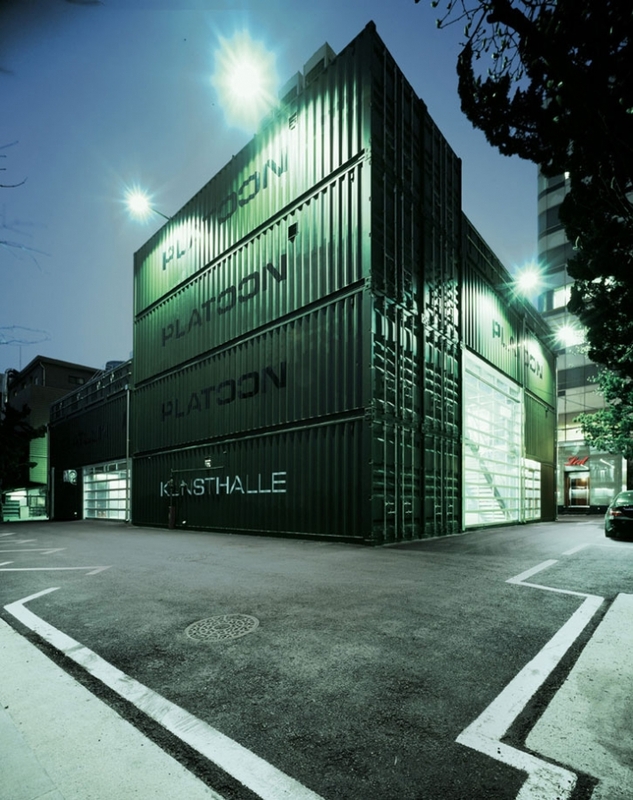 On April 11, 2009 PLATOON KUNSTHALLE, in Seoul opened its doors to the public, the space is used for subculture in Asia. Constructed by 28 ISO cargo containers which were brilliantly and thoughtfully stacked as if a young child was playing and placing building blocks one on top of another trying to construct a building. 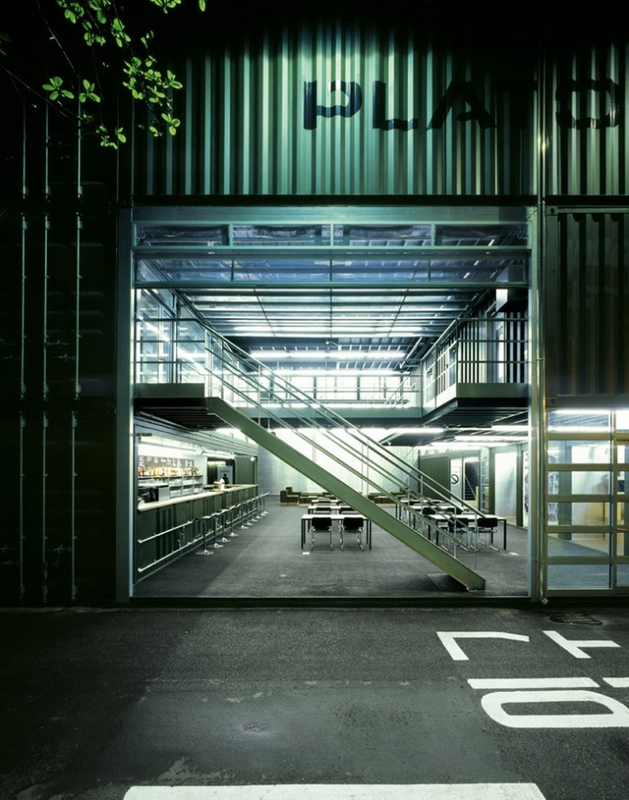 The Platoon Cultural Development building is an excellent execution of shipping container architecture by Graft Lab. 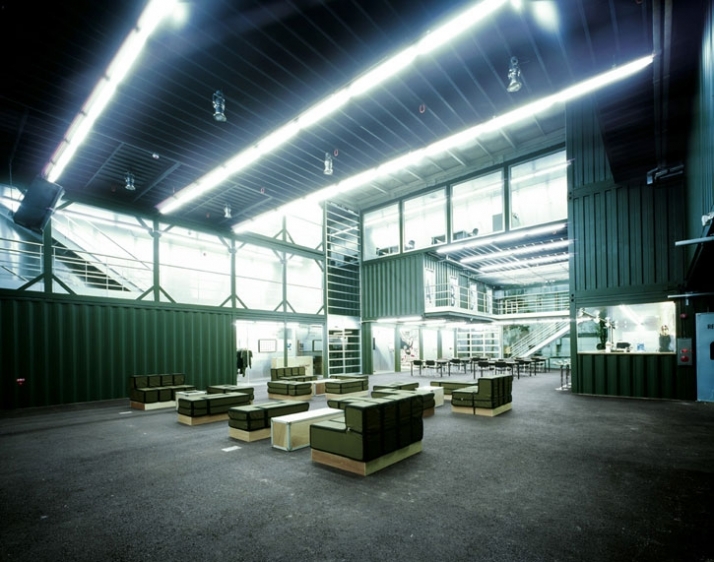 The representation of the 28 ISO cargo containers is one of flexible architecture in a globalized culture. The stacked ISO containers form a unique construction that can be rebuilt anywhere else at any time; giving off a sense of mobility. 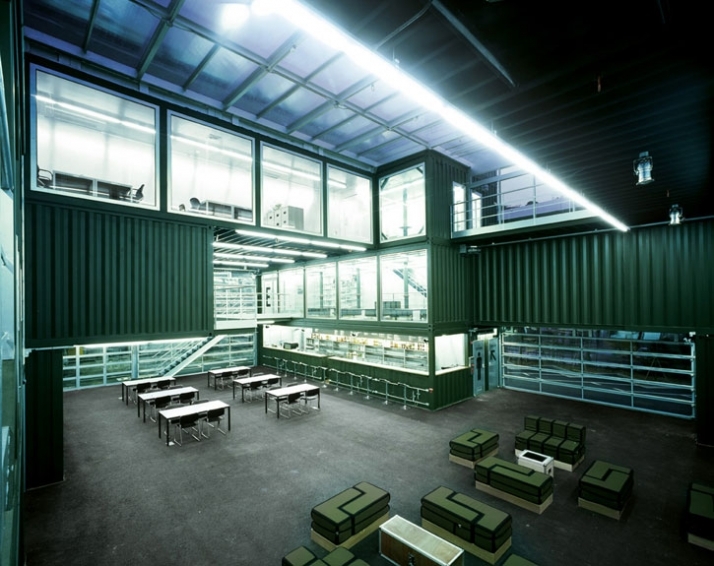 PLATOON KUNSTHALLE is located in Cheongdam an upscale district of Seoul, creating a tension and interaction between the design houses, the luxury brand shops, and the commercial galleries which are near by. PLATOON’s location creates a contradiction between the world of subculture and the world of “culture” and luxury. The interiors give a sense of a revolutionary, urban design with many industrial influences. Perhaps, that is what is intended of the interior and exterior design of the building. However, PLATOON KUNSTHALLE is very much inspired by the original PLATOON architectural development in Berlin which is also design by Graft Lab. 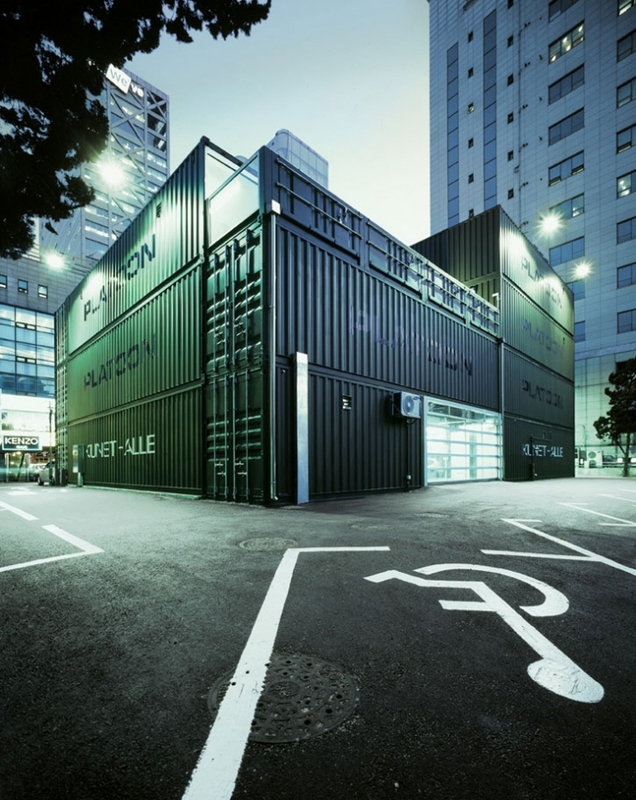 The enhanced arrangement of the cargo containers in Seoul was developed after careful thought and inspiration of PLATOON and Graft Lab and it was developed and illustrated by Graft. Baik Jiwon, in collaboration with PLATOON developed the interior finishes and the furniture. We love the lighting, the colors and the simplicity of the design. The interior gives off a very rebellious feeling, with army – like inspirations, very industrial, very underground, very cold, yet hot with all the rebellious artist souls who share their dreams in PLATOON KUNSTHALLE. 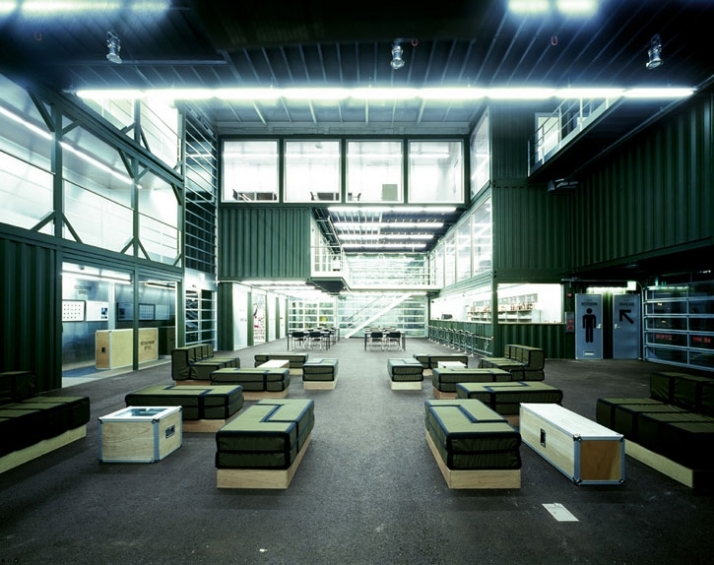 The PLATOON KUNSTHALLE Cultural Development Center houses exhibitions, while it includes a bar - restaurant, an event hall, artist studios, a library, a lounge, office studios, a workshop room and a roof top bar. Its programmatic orientation towards cultural movements beneath the radar creates a dynamic space where new ideas are born and presented. In 2000, PLATOON Europe headquarters was established in Berlin, and ever since it runs diverse cultural and communication projects in cooperation with an international community of 3,500 creative’s all from different professions. PLATOON aspires at providing a communication platform for street artists, graphic designers, fashion designers, video artists, programmers, musicians, cultural clubbers, political activists and merely anyone who is interested in subculture creative fields. PLATOON KUNSTHALLE isn’t about entertainment; it’s about providing showcases of underground artists, studio residencies and a fine selection of cutting-edge stage performances aiming at introducing the vigorous possibilities of subculture in Korea and Asia. Exhibitions, movie nights, concerts, multimedia performances, workshops and discussion panels are presented in various formats aiming to present subculture through these special events. 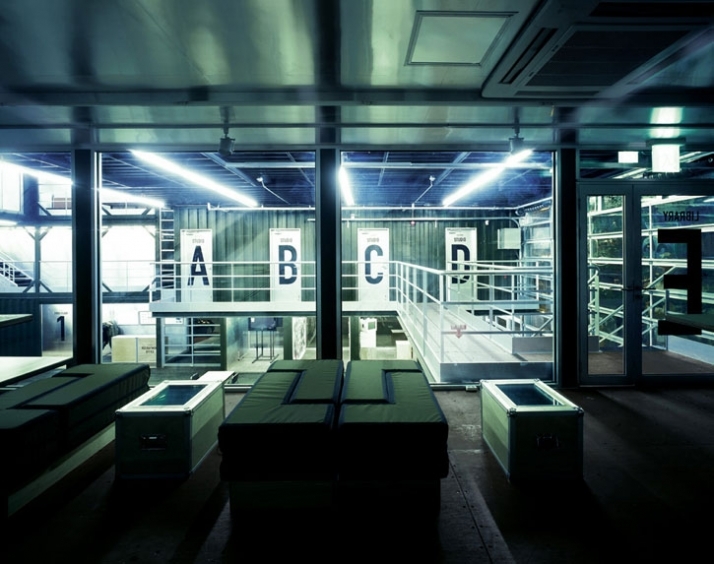 While PLATOON KNUSTHALLE gives the young artists from Korea and abroad a unique opportunity of four scholarship programs if they develop creative projects (for more information log on to http://www.kunsthalle.com/). The four showcases are presented in a monthly basis where striking work from the subculture and street art including leading artists of the international urban art scene are viewed.